Give back to breast cancer awareness in October with the Beautyblender makeup sponge. Created by Hollywood makeup artists Rea Ann Silva and Veronica Lorenz, the Beautyblender is a revolutionary makeup sponge applicator. This unique sponge gives you a flawless finish to your makeup with no lines. Its ellipital shape allows you to get into hard-to-reach areas. You can use the multi-tasking sponge to apply foundation, blush, concealer, self-tanner, mineral makeup and powder. To use it, you simply dampen the Beautyblender, dip it in your product and bounce (or stipple as they say) onto the area to deposit and blend your makeup. This video demonstrates how to use the Beautyblender, along with how to clean it after each use. Plus it’s recyclable! You can purchase the Beautyblender online at Beautyblender.netfor $19.95 and at salons and spas worldwide. You can also purchase kits with their cleanser and more. During the month of October, Beautyblender is giving back 10% of all sales to the National Breast Cancer Foundation. October is Breast Cancer Awareness month. For more information about breast cancer, turn to Pink Ribbon Review, where Karen blogs about raising breast cancer awareness. October is Breast Cancer Awareness month and companies around the globe have created and designated certain products with proceeds from their sale going to various breast cancer awareness, research and support organizations. If you are shopping for fashion or beauty products this October, shop pink! In October, the Beautyblender will donate 10% of all sales to the National Breast Cancer Foundation. It was a hit at Fashion Week and it is called Beauty Blender. It’s an egg shaped makeup applicator brought to you by celebrity makeup artists Rea Ann Silva and Veronica Lorenz. They developed this sponge because they noticed that the traditional triangular makeup sponges were creating harsh lines because of their straight edges. The Beauty Blender feels like suede on your skin and the curved edges mold perfectly into hard to reach corners and creases and you won’t see harsh lines where your makeup ends with this. It is the perfect tool for blending for those who prefer to use sponges. It’s even nice for those of us that like to use our fingers to apply our foundation because you can use it afterwords as a buffer to blend the edges by your jaw and hairline for a smoother, professional looking finish. You can also dab extra concealer on a blemish or scar using the smaller end. The cleanser pictured below is kinda funky too. I usually wash my brushes/sponges with soap and water, but this just looks cool lol. Directions for using Blendercleanser: Wet Beautyblender. Apply a dime-sized amount of Blendercleanser to soiled areas of Beautyblender. Work into a lather, rinse, repeat if necessary. Squeeze to remove excess water. Set Beautyblender on insert pedestal to dry. All in all, its really just important to make sure you blend. It should never look like you are wearing a mask, so by blending your foundation until there are no hard lines at the jaw line, hair line, or in creases by your nose and eyes you achieve a natural look and people will just think you have perfect skin. This is a new primer from Kanebo. It looks and feels like water yet it performs like a silicon primer. I was skeptic. How can makeup last without silicon? I have been struggling with primer after my face did a 180 degree turn and became dry. My beloved silicon formulas were drying my skin and leaving my makeup in patches. I realized with regret that I needed to make a change into more moisturizing formulas. This primer was created to smooth and firm the skin prior to makeup application. It boasts the ingredient cellulose. This creates a invisible veil that leaves skin smoother and a perfect canvas for makeup. It also boasted improved moisture results. According to Kanebo, after 30 minutes after application, the moisture content in the tested area rose by more than 400%. This is a pretty speedy and high stat but I am game. The primer is very watery yet feels like a lotion. This is a surprisingly weird yet cool texture. It did not melt into the skin right away. In fact it sat on the face. I rolled with it and got a cup of coffee. By the time I got back to my mirror it was set. Not exactly dry but you could tell it was safe to start putting on your makeup. It looked super hydrated yet had that glass-like appearance of a silicon. The Smoothing Water Make-Up Base works better alone with just foundation. It does not need any moisturizers or serums. The foundations I tested with it are as follows, Kanebo Fluid Finish, La Mer, Carmindy and Make Up Forever High Definition foundation. All lasted well through a harrowing 8 hour workday. I found the best results with La Mer and Kanebo. I applied my makeup with my beauty blender sponge. The only change I made was using less foundation with the Kanebo Fluid Finish. This formula just requires less product to be used. The Smoothing Make-Up Base retails for $45 and is available athttp://www.kanebo.com/, select Saks, Bergdorf Goodman and Barneys. Call 1-866-271-6815 for other retailers and any questions. 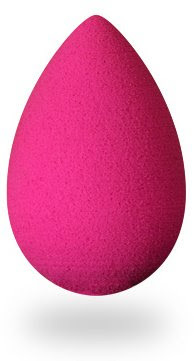 Beauty Blender is an egg-shaped, spongy makeup applicator. It comes with it’s own countertop base and bottle of cleanser (for the sponge). This unique makeup applicator is funky and fun. It takes just a little practice and the reward is a very nice flawless application. It has a stippling effect much better than most brushes or regular sponges, achieved with dabbing the end onto your skin instead of using fingers. It’s unique pointed end gives great access to hard to reach places and easily blends all the way into the hairline. The price was $34.95 for the applicator and cleanser…a bit spendy for just a sponge, but it is fun and different and brags that many celebrity makeup artists can’t work without it. $19.99 + international shipping? expensive for a sponge don’t ya think? i read nothing but raves on forums and blogs but it took sometime before i said, what the heck, it may be worth it! Thanks to ms.vanessa for sharing purely cosmetics and the free shipping promo that time, i was able to get me one. – cutesy & pink – nice to stare at! i’ll get myself a back up..yes its worth it! its not the normal flocked sponge, its way better..it works wonders. my foundation blended so seamlessly with my face. one dab and the foundation sinks on my skin. all my foundation brushes failed in comparison with beauty blender IMO and i prefer it wee bit than mac 187 . Don’t get me wrong, i love my brushes but its really easy to apply liquid foundation with the sponge! the only problem for some maybe its to small, that it takes longer than normal to apply. go get if money is not a problem, its a must buy!! BEAUTY BLENDER, $19.95. The rounded curves of this ultimate makeup tool give makeup application a clean, even finish with no hard or visible edges. The shape also allows access to hard-to-reach areas like under the eyes and the sides of the nose. In October, BeautyBlender will donate 10% of all sales to the National Breast Cancer Foundation. Available atwww.beautyblender.net. The beauty industry isn’t focused solely on making women beautiful on the outside. Cosmetic companies, large and small, specialize in charitable endeavors, whether it’s creating a product expressly for donated proceeds or donating a portion of profits from already popular products. It’s not only a gesture of good will towards worthwhile causes, but also a way for companies to express creativity in their humanitarian efforts! We’re offering our round up of the some of this season’s charitable products to help you look and feel good about primping! Who Benefits: During October, National Breast Cancer Awareness month, beautyblender will donate 10 percent of all sales on www.beautyblender.net to the National Breast Cancer Foundation. The egg-shaped beautyblender is hot pink, making it a no-brainer to partner up in the fight against breast cancer! Why Buy: Don’t giggle, but this cute ‘n curvy sponge that is similar to you! It not only looks incredibly cute sitting on your vanity when not in use but it’ll adapt to the shape and contour of your face and eyes, is a multi-tasker that, when wet, can apply self-tanners and foundations, remove make up and smudge eyeliner, absorb shine. It’s an indispensible, odorless and latex-free tool that’s sold solo or with its own lavender-scented cleanser. You are currently browsing the Beautyblender's Blog blog archives for September, 2008.